NAIROBI , Jul 14 2013 (IPS) - REDD – reducing emissions from deforestation and forest degradation – would seem to be a mitigation strategy that perfectly matches Africa’s needs. “REDD is a very good thing for Africa, though you will always get detractors looking for the downside. It is especially good for the countries with predominantly miombo (or savanna) woodlands,” says Sharon Kockott, a director of Conservation Science Africa, a company working on the conservation and rehabilitation of community rangelands in Botswana, Kenya, Zambia and Zimbabwe. The EcoMakala REDD project near Goma, in the eastern part of the Democratic Republic of Congo, seems to take some of these criticisms into account. It was first established by WWF Belgium in 2007 with the aim of reducing deforestation by creating micro plantations of fast-growing trees to provide charcoal makers an alternative to chopping down trees in the protected forests of the Virunga National Park. The project set up 5,000 hectares of micro plantations, and distributed 4,000 clean-burning stoves that help optimise use of charcoal. EcoMakala's current phase is designed as a true REDD project, which will include detailed measurement of carbon stocks and a methodology for conservation, as well as raising awareness of the value of the forests and the idea of the ecological services it performs. The project is currently running behind schedule for reasons that expose some of the challenges to be overcome if REDD is to become a significant and effective source of climate finance in Africa. REDD works by calculating how much carbon is stored in trees in a particular area and issuing carbon credits for maintaining and sustainably managing this sequestered carbon. Kockott tells IPS that protecting the carbon stocks in savanna woodlands is as vital to mitigating climate change as protecting the rainforests of the Congo Basin. “The theory behind REDD says that a forest doesn’t exist in isolation – especially the savanna woodlands. Think of it as a dam. The most water is in the deepest part of the dam (the biggest carbon stocks are in the equatorial rain forests) and the savannas are like the edge of a dam – the shallow water actually recedes the quickest,” she says. But Nnimmo Bassey, the director of Health of Mother Earth Foundation and a member of the No REDD in Africa Network thinks otherwise. “REDD is a false solution for climate mitigation. When you guard a particular forest without offering an alternative solution, the loggers will definitely move to other locations because the need is still there,” he tells IPS. “The net effect is that deforestation isn’t halted. Even if it did for a particular location, there is no assurance that it would do so in perpetuity,” Bassey says. REDD risks simply barring forest-dependent communities from project areas, Bassey argues, displacing them in exchange for a limited number of jobs as labourers or guards of the forest resources they previously enjoyed. Billions of dollars have been pledged to develop, implement and expand REDD, but studying a funding tracker like the Overseas Development Institute’s Climate Funds Update, it is clear that relatively little of this has actually been disbursed so far – especially in Africa. Climate change mitigation requires detailed, accurate data and verification mechanisms. Developing REDD has quickly revealed gaps in the administrative capacity of various local, national and even international institutions in Africa. 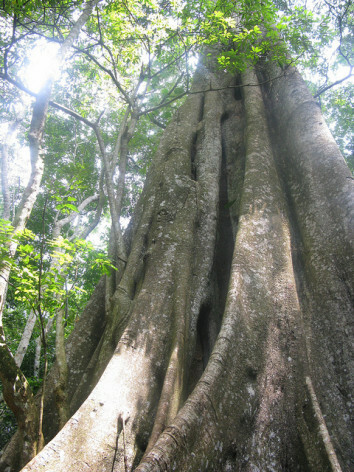 The challenges schemes like REDD must overcome include the complexity of establishing reference levels – determining things like just how much carbon a given piece of forest holds, and how that will change over time under a “business as usual” scenario – and designing a project that will produce better results. Then once those questions are settled on paper, there is the immense problem of verifying estimates and projections against realities on the ground in often hard-to-reach locations. The difficulty of credibly accomplishing all of this is reflected in the fact that thus far REDD carbon credits are not part of the compliance market, of credits that count towards meeting formal obligations to reduce emissions. Instead, carbon credits generated by REDD are part of a voluntary market, purchased by companies as part of corporate social responsibility. The Kasigau Corridor REDD project in Kenya, for example, sold some of its first tranche of 1.45 million voluntary carbon units – representing the same number of tonnes of sequestered carbon – to South Africa’s Nedbank, as part of the bank’s positioning of itself as a carbon-neutral company. African governments are working to set up the frameworks needed to apply for, receive and manage REDD funds. The Democratic Republic of Congo (DRC) has a well-established National Coordination for REDD, and is putting a National Forest Monitoring System in place. Kenya is busy with similar processes, as well as considering the creation of a national climate fund to absorb international climate finance and catalyse private funding, and align this with the country’s national priorities. Philip Mrema, the programmes officer for Forests & Climate Change at the Pan African Climate Justice Alliance says that REDD should take a people-centred approach, one that strengthens sustainable forestry management, enhances carbon stocks, maximising environment and social co-benefits, hence improving livelihoods. Thank goodness for Nnimmo Bassey’s no-nonsense analysis of REDD’s fatal flaws. The other views expressed in this article appear distorted by promises of dubious benefits, made by those that seek to usurp Africa’s natural wealth to support their addiction to pollution.